The 1912 class at the Glenn Curtiss Aviation School on North Island, near San Diego. Milwaukee's John Kaminski (in white shirt and tie) is second from the left. Unlike the previous year's class, which was almost entirely comprised of students from the military, the Kaminski's class was a disparate, international group. From the left they are: Barlow, Kaminski, Smith, Russell, Mohan Singh (India), Lansing Callan, Julia Clark, and K Takeshi (Japan). John Kaminski brought several of his fellow students home with him to Milwaukee where they were all scheduled to appear at the 1912 State Fair. 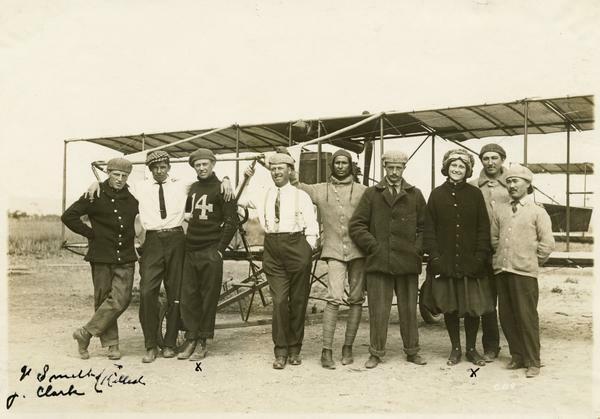 They included Callen, Motohisa Kondo, Julia Clark, together with a more experienced Curtiss pilot, Horace Kearney. Early pilots had a short life expectancy, and John Kaminski annotated this photograph from his scrapbook to note the two who died shortly after completing their training. Of these two, Julia Clark died less than a month after her appearance in Milwaukee. A photograph of her elsewhere in Kaminski's scrapbook is inscribed: "the best of lucky to the youngest aviator in the world." Kaminski was lucky, for he never experienced a serious injury during his flying career.